We decided to make today a rest day. Frankly, it wasn’t a hard decision. This holiday continues to take its toll. We’ve scheduled various rest days in amongst all the theme park madness, although we haven’t kept to the original schedule. One of the many benefits to having a do-nothing day is that I get to catch up on my blog writing. I’ve tried as best I can to finish the day’s blog at the end of the actual day but that’s not always doable. Sometimes we get back from a full day at one of the parks and are fit for little more than crashing. I’ve tried not to get too far behind, but a day is acceptable. Two days is just about the limit. Anything more than that and I run the risk of not recording everything in the detail that I want. This morning, I managed to catch up a full day, leaving me just one day behind. It doesn’t take long for one or more of the kids to start getting bored. 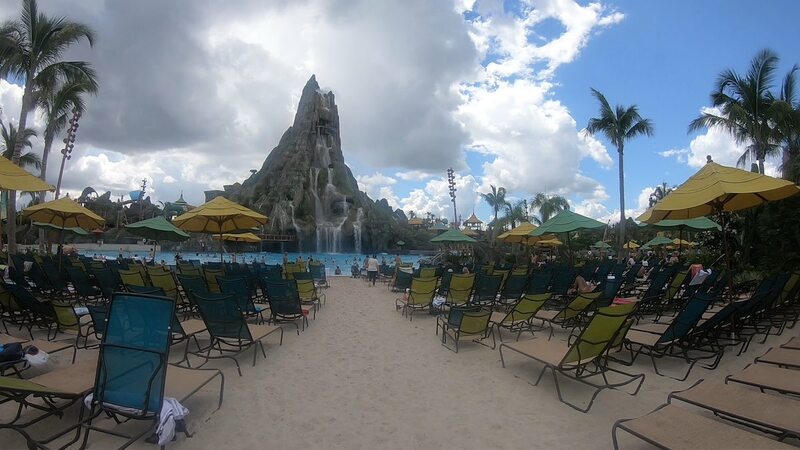 Before the end of the morning, Jennifer was already chomping at the bit for me to take her to Volcano Bay, the latest theme park in the area. 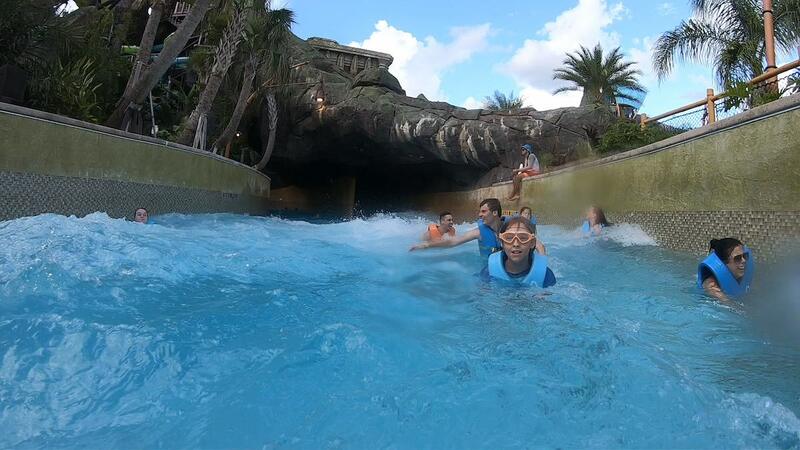 As a Universal water park, it’s one that’s included in our all-access Universal tickets. Since Sandy and Joey were happy to spend the day relaxing at home, Jennifer and I got ourselves ready. We made it half way down 192 looking for a place to eat that Jennifer was happy with. After some discussion, we ended up going for a Waffle House, since that involved the least risk of one or other of us not liking whatever was on the menu. By and large, a stop at a Waffle House generally sets me back between $10-$12 per head once tax and tip are factored in. In fact, this isn’t far off for most places we eat at. It can be closer to $20 per head at places like Chili’s, Applebee’s, Ruby Tuesday’s and other such mid-range restaurants. For Volcano Bay, you use the same parking facility for the other two main Universal theme parks. You are also charged the same $22 for the privilege. We were directed to a particular section before boarding an awaiting bus over to the water park. On board the bus were a number of video screens playing a brief movie explaining how it works in the water park. Upon entering, you’re issued with what they call a TapuTapu, which is a wrist-worn device rather like a large watch but with an LCD screen instead of a watch face. 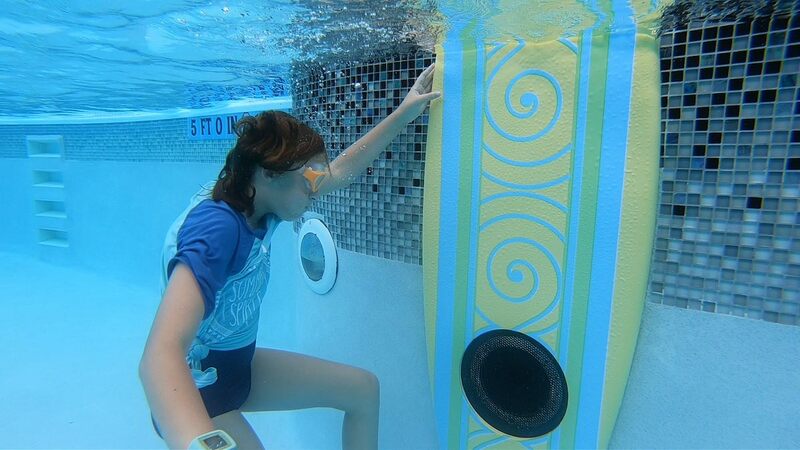 When you want to enter a ride (water slide, raft ride or whatever) you tap your TapuTapu against a panel. That registers your intention to enjoy that attraction. If there’s no wait, you’re allowed to proceed to the line. If there’s a wait, you’re provided with a return time, which essentially means you’re in a virtual queue and are free to enjoy yourself elsewhere in the meantime. The display provides other useful information as and when needed, like when a ride is temporarily closed or when it’s your turn to return to the ride and enter the queue, etc. There was a bit of a walk from the bus to the security check-point and then another bit of a walk to the main turnstiles. Once inside the park, it was a further few minutes to get into the park proper and somewhere to park our bags and sit. From the car all the way to our chair at the wave-pool beach was really quite an exercise. I was glad that we were dropping ourselves into some warm water after it all. 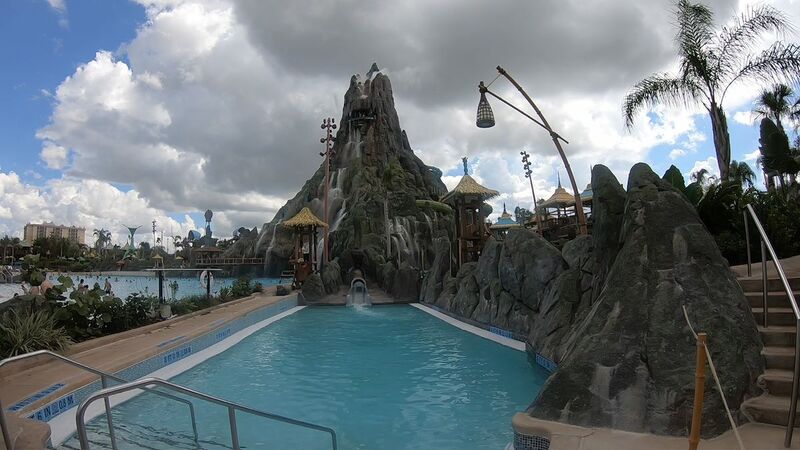 Volcano Bay has a Polynesian or South Pacific island theme to it. 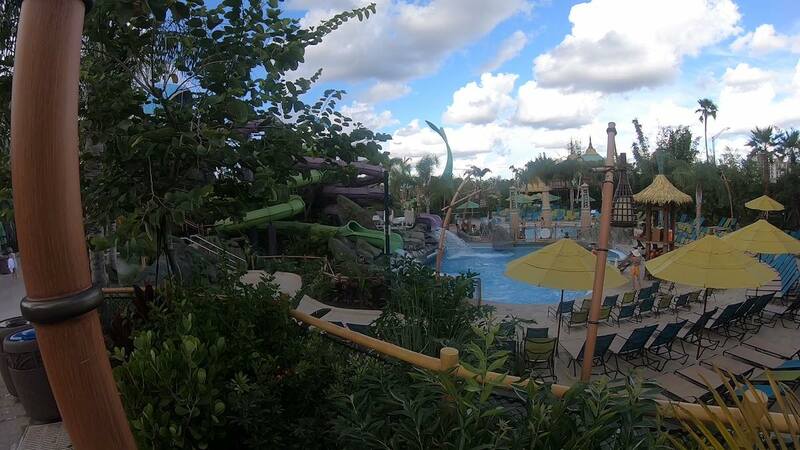 The theming is done very well – certainly as good if not better than the Disney water parks. Once we established our place in the park with our things on a couple of chairs, we set off to explore, via a bit of a swim in the main wave-pool lagoon. 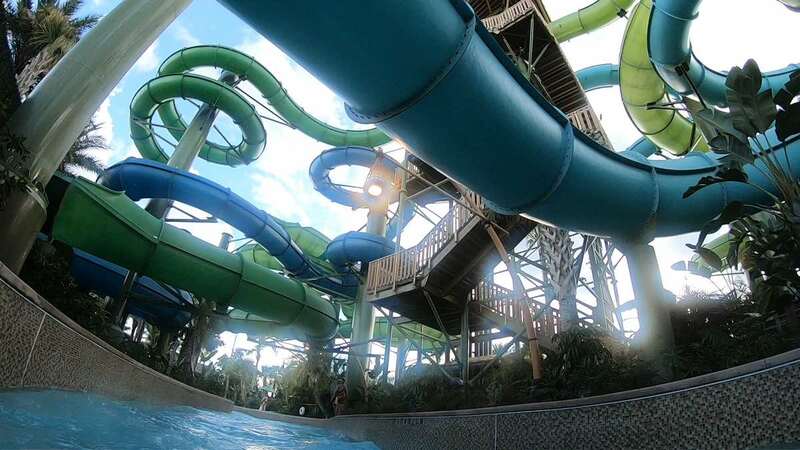 The park is split into different sections, all paraded around the huge volcano centerpiece, which serves as the superstructure that supports many of the bigger flumes and shoots. A couple of different rivers pass through its base also. Everything is brightly coloured, and we were a little unsure at first which direction to head in. 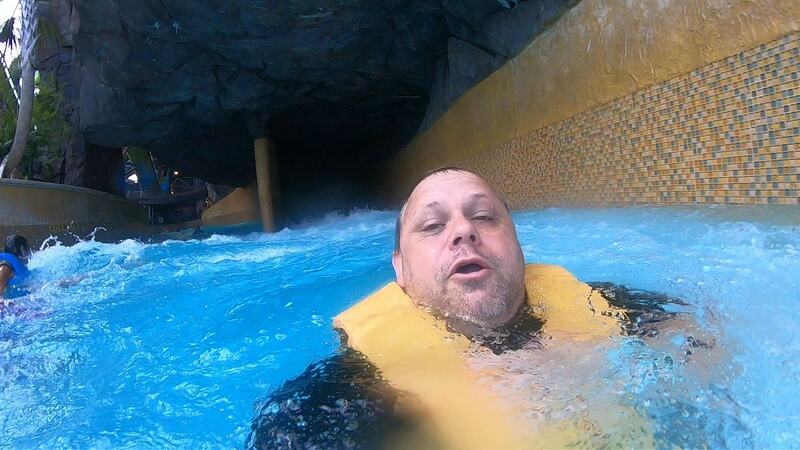 We stumbled in to an entrance to the lazy river, so we waded in and grabbed ourselves an inner tube each. Jennifer disposed of hers almost immediately, but I spent a good chunk of time resting in mine and doing a number of GoPro selfies with continuous monologues. I’ve no idea why but I just seem to be able to think of lots of ways to say nothing at all as I pass the time. The water was quite warm. Even the dousing you get every few metres from some jet or spray was quite pleasant. We completed several circuits in the river before Jennifer decided she was ready for some more thrills. A couple of the more prominent rides appeared to be family raft rides, so we thought we’d give those a try first. We arrived at the base of the ride and I was already in mid-sentence with the GoPro, looking forward to an unbroken filming of the ascent and subsequent descent. Alas, I was thwarted at the entrance when it was pointed out that GoPros (they mentioned them specifically by name) and other such things weren’t allowed to be taken on any of the main rides here. 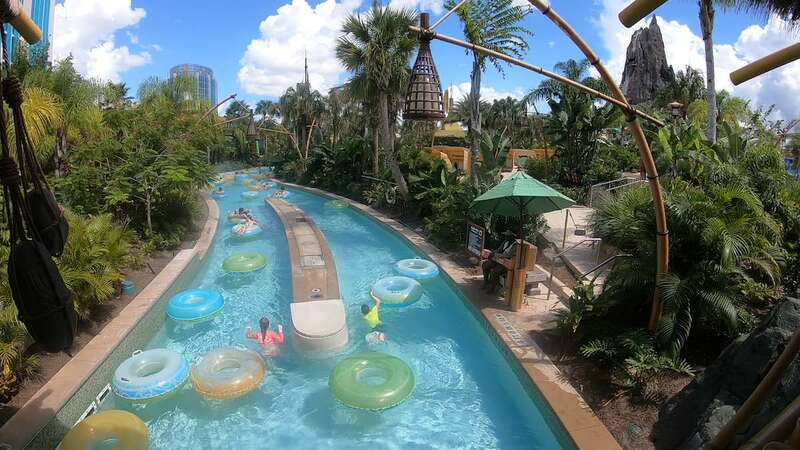 They are good for the wave-pool lagoon and rivers but not the slides, rafts and flumes. They do have lockers, but you have to pay for them. Naturally, I wasn’t carrying any cash. This was an annoyance to be sure, although I half expected to run into this problem. I half-heartedly protested, pointing out I now needed to go all the way back to the other side of the park to collect money to take my GoPro to the locker, etc. At the entrance to each of the bigger rides are a few erected surfboards with shelves on them. One of the attendants pointed these out to me and suggested I could leave my things there. They seemed confident this wouldn’t be a problem and that people do this all the time. One even suggested that people sometimes hide things in bushes temporarily and that this was quite normal. I removed my rashy top and wrapped it around the GoPro so as to obscure it from sight, and placed them both on the top surfboard shelf. We were now free to climb the themed gantry to the launching point. 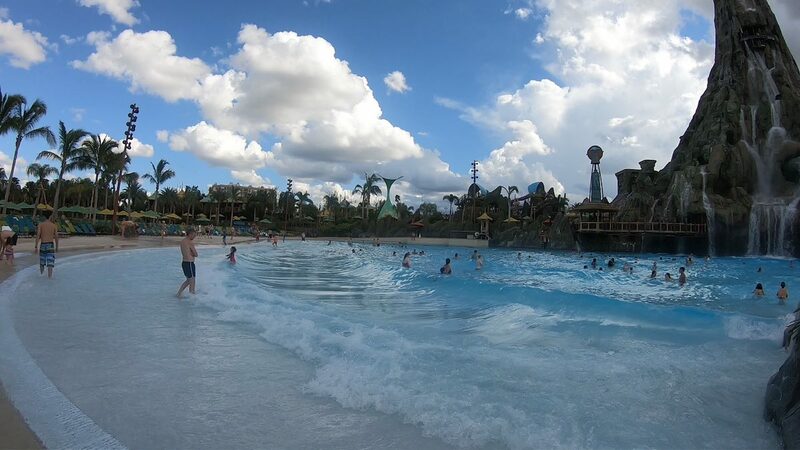 Generally speaking, what makes any water ride a good one is the speed and duration of the drop. What goes up must come down, so the higher the starting point, the better the ride. 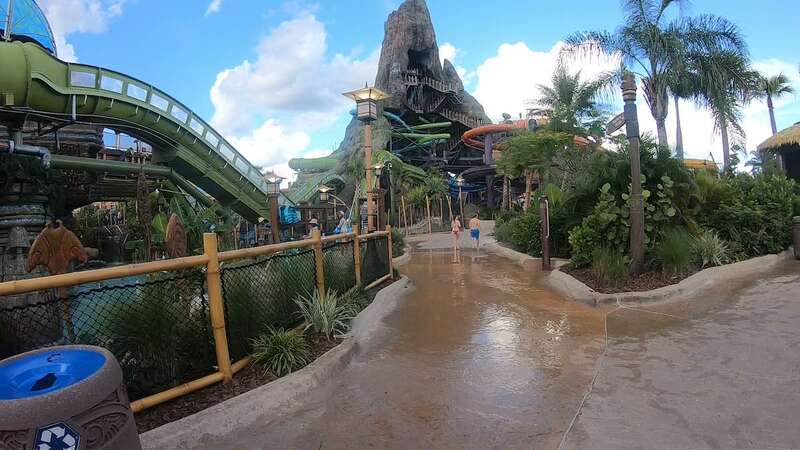 The climb to the top starting point of the rides at Volcano Bay are long and arduous. We were both thoroughly knackered by the time we reached the entry point (me more so than Jennifer, I fear). The reward was that it was a brilliant ride. The rafts supported five people in a star configuration, but for our ride it was just Jennifer and me. There are a couple of very nice drops along the route, which was a lot of fun to traverse. 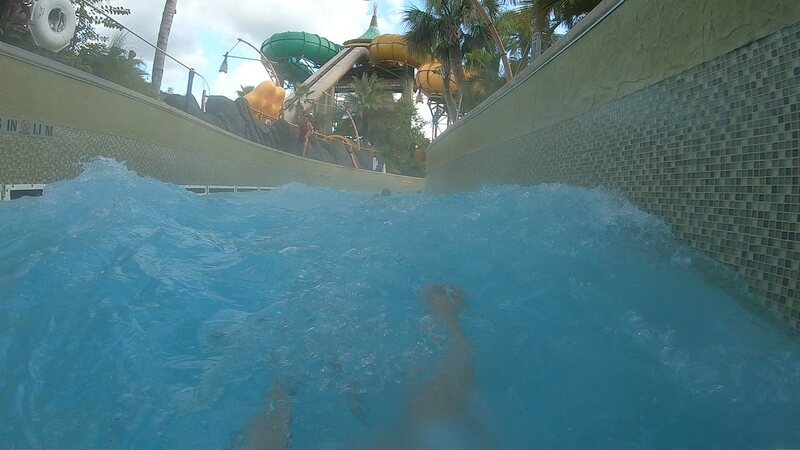 We exited the ride at the bottom collecting pool after a minute or two of adrenaline-rushed pleasure. Eager to experience more, we decided to try the main thrill ride at the park. It’s a capsule you stand inside on a trapdoor. After a brief countdown, the trapdoor is rapidly opened, and you fall vertically into the tube below. Several seconds later, and with your screams still echoing behind you, you emerge at some considerable speed into a water-filled channel, where the awaiting water eventually brings you to a splashing halt, and you contemplate the fact you’re still alive. The starting point for this death-defying madness is the very top of the enormous volcano at the centre of the park. Secretly, I was teetering on the edge of both wanting and not daring to attempt this ludicrously fear-inducing ride. Jennifer, on the other hand, proclaimed she definitely wanted to do it, so that pretty much made up my mind for me…unfortunately. We asked for what we thought was the sheer drop slide and were directed accordingly. It was until we were nearly at the top of our climb through the superstructure of the volcano (some eight hours later…or so it seemed to me) that we realised we were actually in the wrong line. It transpires there are three of these sudden drop capsules – a red one, green one and blue one. All three start from the same platform just beneath the volcano’s tip. The red one is the one that drops you straight down and it’s pretty much a straight trip to hell the bottom – just like the main slide at Disney’s Blizzard Beach. We were actually in the line for the green and blue ones. 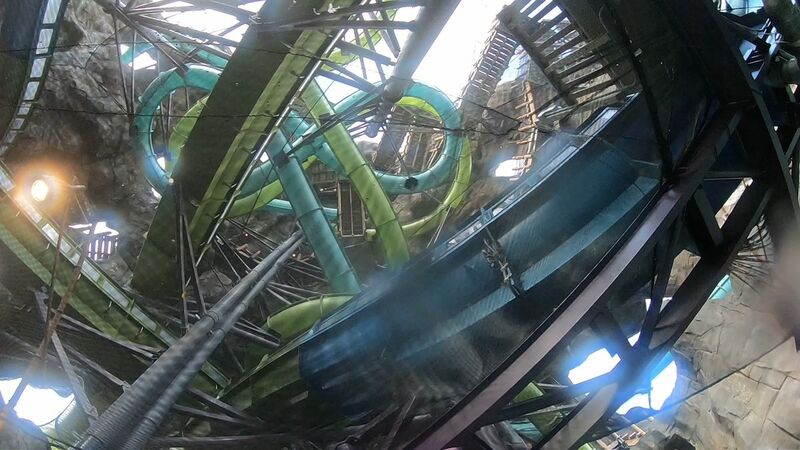 These are essentially the same, but once you drop, you enter into a twisting and turning flume that snakes its way through the volcano’s superstructure. You eventually exit at the bottom, coughing and spluttering and wondering just why on earth you went in there to begin with. Some minutes later, when I had regained full control of my bodily functions again, we decided to take a ride on what looked like a four-man bobsled raft. It also snaked its way around the volcano and looked pretty awesome from above. The raft is an inflatable that seats four people in a row. Curiously, the raft travelled not only downhill but also uphill at several points. 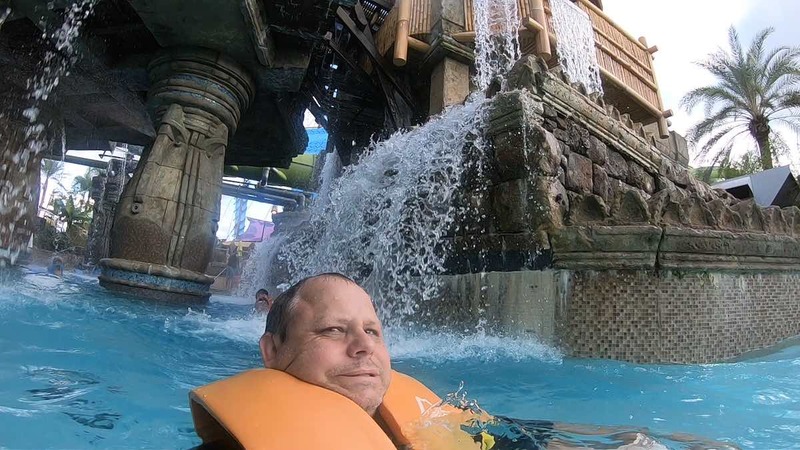 I’ve been on something similar to this before in Dubai, where there are strong jets of water that propel the raft through the uphill sections. This one, however, had no such jets of water, so it wasn’t entirely clear just how it was propelled. I assume some sort of induction system with magnets in the bottom of the raft. It took a while, but we finally found the entrance to the ride to tap on with the TapuTapu. We were given a 40-minute return time, so we went off to enjoy ourselves for that length of time. As we did, the TapuTapu counted down the time until it was our turn to ride. During that time, we explored some more of the park before I decided it was time for a snack. We had earlier stumbled into one of the various counter service joints, where I eyed a foot-long hotdog and chips (fries) option. I figured that would hit the spot, so we made our way back there (eventually). I was hit with the first of a couple of disappointments upon arrival. The first was that the ‘chips’ was of the American kind. In other words, the foot-long hotdog was accompanied not with a serving of fries as I had first thought but with a bag of crisps. Seriously? I’m being charged $13 for this? My disappointment was palpable, but I ordered all the same, expecting to have at least something of a meal for that sort of money. Despite there being only a couple of other people waiting, it still took quite a while for my tray to come through the window, at which point the next disappointment struck me full force. It may be called a foot-long hotdog but what they give you in length they bloody well take away from you in girth. The wiener was no wider than my little finger. It was sat inside the void that was the opening of a stale bun. It was the most pathetic looking excuse for a meal if ever I saw one. And even the bag of crisps was just plain – not even salted. Talk about rip off. Seriously, I don’t know why I should be surprised at the audacity of how they rip you off with this shite inside the parks. Jennifer, in the meantime, was at least enjoying her churro. Of course, she wasn’t at all concerned with the gaping hole even that sliver of a snack punctured in my wallet. But I digress. When we finished what I laughingly describe as our meals, our TapuTapu was indicating that the raft ride we had been waiting for was temporarily closed. There were a few clouds in the sky but no thunderstorms or lightning we could see. It must have been some sort of technical issue. Rather than dwell on that disappointment, we had another wander around to see what else we could experience. In doing so, we stumbled across a bridge under which we saw several people whizzing past in life-vests in very fast-moving water. It looked awesome, so we inquired about it. It turns out that this park has two rivers – a lazy one with inner tubes and an adrenaline fuelled try to stay alive as long as you can one with buoyant life vests. Both Jennifer and I wanted some of that thrilling action, so we set off to try to find the way in. That turned out to be a lot harder than we at first thought. No less than five times were we directed – by uniformed staff I might add – in different directions that all led to dead ends. I was starting to lose the will to live before we eventually found the secluded cove that serves as both entry and exit point for the rapid river. We each donned a life vest and heeded the numerous warnings posted about ensuring that our TapuTapus were fastened securely. Clearly, this was going to be a wild ride and one that strips TapuTapus from people’s wrists on a regular basis. 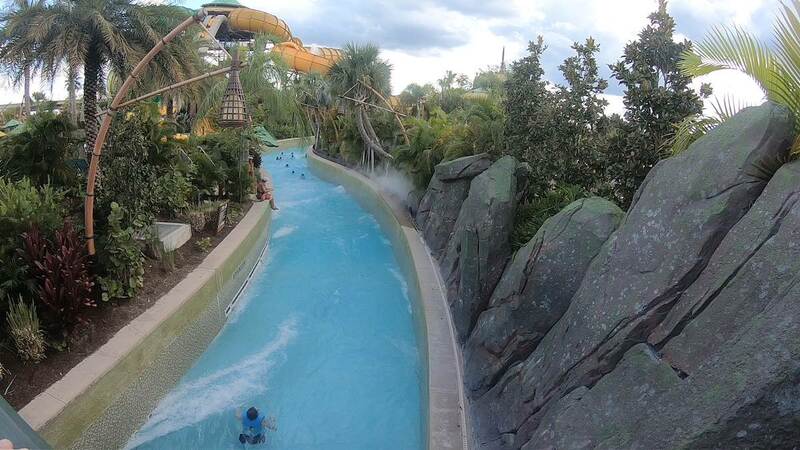 The wild river (TeAwa) turned out to be one of the highlights of our day at Volcano Bay. Firstly, the water moves very quickly – and I do mean ‘very’. It’s about a five-minute round trip around the entire course. While that’s happening, there are sudden bursts of waves that come seemingly out of nowhere to gobble you up. Numerous changes to the depth and width create wild turbulences that can be really quite intense. Every now and then, there are strong jets of water that accelerate you along – some of which were so intense as to damn near remove my swimming shorts from me. We made several full circuits – most of the time I was filming myself with the GoPro, or at least attempting to between the repeated submergings I was being subjected to. Both Jennifer and I absolutely loved it. Eventually, however, sheer exhaustion meant that we just had to exit. What a wild and thrilling experience it was. As much as we loved the wild river, we also still wanted to have a crack at that four-man raft ride. There were still lots of other rides we hadn’t done either, but it was by now fast approaching the park’s closing time. Literally minutes before the end of the day, the raft ride re-opened for business, so we hightailed it over there. We were probably among the last few people to enter and get onto the ride before the park closed. We were both glad we made the effort as well. The raft does indeed get propelled (somehow) uphill at numerous points around the circuit. Whatever is doing the propelling does so with some gusto. We practically flew over the crest of the hill each time. This was also one of a handful of rides that snapped a photo of you during the ride. We exited the ride feeling exhilarated and energised. Alas, however, it also coincided with the closure of the park. We made our way back to our little spot on the beach to collect our things and headed to the changing rooms. Today was a day of highs and lows (literally even). The high we experienced from the raft ride was quickly followed by the low of the insufficient capacity of the changing rooms. The park was practically empty but there was still a lengthy queue of men in the male changing rooms waiting to use one of only a small number of showers. I shudder to think what the situation would be like on a busy day. I eventually ended up giving up on the idea of a shower and just dried off and changed instead. I mean, seriously. This is a modern theme park. Is it really that difficult to design it to accommodate for the number of people expected? 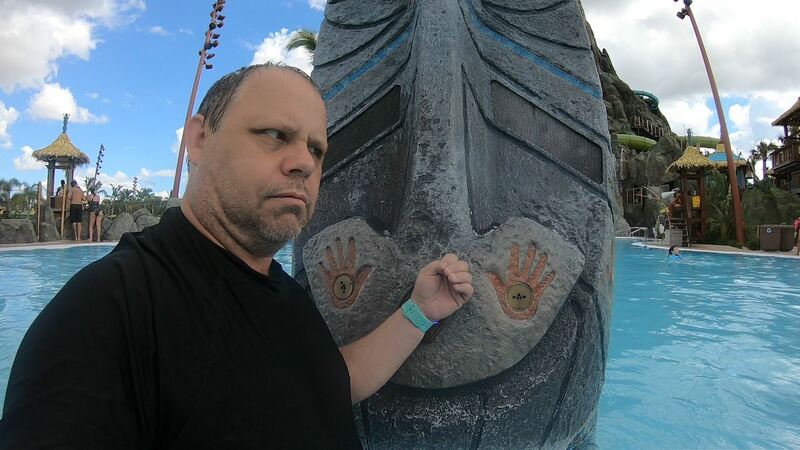 Since we had been photographed at least once during the course of the day, I stopped at a totem pole that had a touch screen photo booth. People were using it to inspect the photos taken of them during the day. Unfortunately, there were about fifteen other people lining up to inspect their photos as well. Again, it seemed like a drastic inability for the design of the park to accommodate for the numbers. We made our way to the front of the park. Fortunately, there were more of the photo kiosks there. It was still busy, but I managed to get to one in the end. It wasn’t clear what I needed to do but I scanned my park entrance ticket and lo and behold, three photos of Jennifer and me in various rides popped up on the screen. The only option next was to click the purchase button but I had no intention of spending their exorbitant asking price for a 5×7 print. I asked for some clarification. One of the assistants said that if we found the photos, they would be linked to our account. Sandy had purchased a photo pass the other day, so I just assumed these photos would be available to us somehow. Armed with that assumption, I exited the screen and we left for the day. On the way back to the bus, we had to pass through a check-point to drop off our TapuTapu wrist devices. They seemed quite keen on getting them back, in fact. In addition to the numerous posted signs and staff watching you remove and deposit them into the bin provided, we then turned a corner and had to walk through an electronic detection system. It looked like one of those car eTag detection systems you see on the toll roads. Cameras and sensors point at you from all angles as you walk through. It was almost like going through one of those airport scanners that see right through into your soul. We found the bus awaiting right outside and piled in. 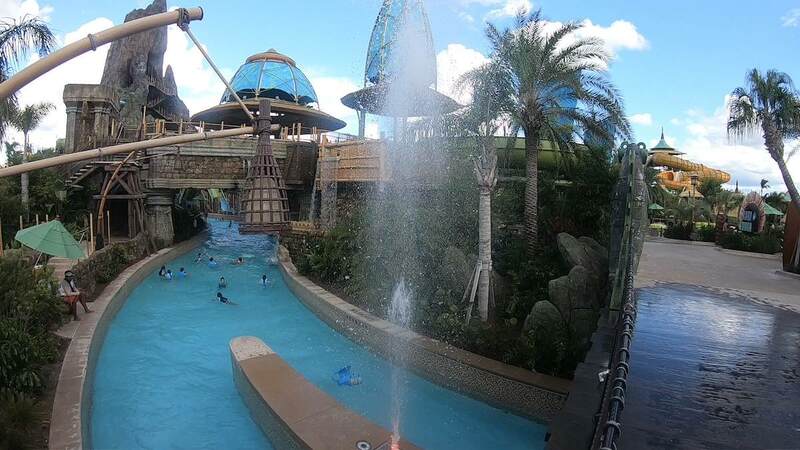 Along with a couple of dozen other happy swimmers, we chatted amiably about how much we enjoyed our time at the park for the duration of the brief three to four-minute ride back to the main Universal car park. Safely back into the car, we set off and considered our next move. Now, I often find myself between a rock and a hard place with my family. You know the kind? Where it doesn’t matter which way you go, it’s going to land you in trouble either way. Tonight was one such situation. Jennifer really wanted to have a bit of Daddy/Daughter quality time with me for dinner. However, being around 6pm, I knew that Sandy and Joey would also be hungry. I suggested to Jennifer that we needed to do the right thing and offer Mummy and Joey a dinner option, so I called Sandy and asked if she wanted me to pick them up to go out to dinner. All the while, Jennifer was pulling a distinctly disappointed face and whining slightly. While on speaker, I heard Sandy call out to Joey to see if he wanted to go out for dinner. Much to everyone’s surprise, he said yes. Left to his own devices, Joey would typically prefer to remain inside the house. Today, he seemed happy to go out for a meal, which Sandy sounded quite pleased with. With that plan now in place, I hung up. For the next several minutes, I had to sit and listen to Jennifer almost in tears telling me just how much she had looked forward to it just being the two of us. Clearly, I was going to upset one if not multiple family members tonight whether I liked it or not. Not seeing an immediate escape route, I called Sandy back so that Jennifer could plead her case in person. I figured this would take the decision out of my hands and I would be safe. Oh, how naïve I can be at times. Sandy seemed audibly disappointed at the prospect of losing out on going for dinner. Already, I’m now giving thought to just where in the doghouse I’d be sleeping tonight. I wasn’t going to win whichever way this was going to fall. Again, Sandy called out to Joey, but this time asked if he would prefer that I brought some food home for him (that’s code for me stopping at MacDonald’s on the way home). This time, he said yes to that idea. Sandy’s subsequent proclamation of ‘Yes, it’s fine! You can do what you want for dinner!’ in somewhat of a huff pretty much confirmed my suspicions. I would be sleeping in the kennel tonight…again. Oh well. Sometimes you just have to take one for the team. Jennifer and I spent the next half an hour in the drive back towards Davenport considering the various dinner options. As it turned out, none of her ideas appealed to me or vice versa. Since this was Jennifer’s time with Daddy, however, I bowed to her wishes and we stopped (some distance AFTER we passed Davenport I might add) at a China Buffet restaurant she particularly liked. The food was mediocre at best but at least the company was good, and Jennifer was a happy bunny. So that’s at least one happy family member tonight, then. We stopped at the MacDonald’s on the way home to pick up something for Joey. Wouldn’t you know it, Sandy wasn’t hungry and didn’t want anything brought home for her. That’s code for…well, you get the point.